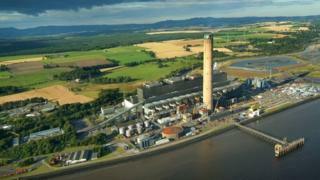 Longannet power station faces the threat of closure within a year unless the cost of connecting it to the national grid is reduced, BBC Scotland has learned. First Minister Nicola Sturgeon has accused Prime Minister David Cameron of not doing enough to safeguard the future of the coal-fired plant. The power station had been due to close at the end of the decade. Talks between its owner, Scottish Power, and National Grid have stalled. Scottish Power has warned that the £40m annual cost of connecting Longannet to the grid makes it uneconomic. Ms Sturgeon had urged Mr Cameron to intervene. However, she has now said he had not offered enough, and unless that changed a decision would have to be made next month on Longannet's future. The BBC understands that would mean closure within a year. UK Ministers have said there is no threat to Scotland's energy security because Scotland could import electricity from the rest of Britain if it became necessary. Scottish Energy Minister Fergus Ewing said: "I welcome that the prime minister says he is taking the issue of security of electricity supply seriously, but from that assurance must then flow action to assess the negative impact of UK energy policy and regulatory regime on Scottish generation. "I am particularly concerned that he seems relaxed that his energy policies are contributing to the potential premature closure of Longannet power station in Fife. "Given that his colleagues in the Scottish Conservatives have recognised the discrimination against Longannet and the need for secure energy generation to continue in Scotland, the first minister has now written back to the prime minister calling on him to increase the transparency around the effect of UK energy policy in Scotland. "With hundreds of direct jobs at risk at Longannet, and the viability of future thermal plants also undermined by transmission charging that is surely the least he can do." A spokesman for the UK's Department of Energy and Climate Change (DECC) said the future of Longannet was a commercial matter for Scottish Power. He added: "DECC takes security of supply very seriously and has worked with National Grid to put in place an effective plan to secure electricity supply. "National Grid have confirmed they continually assess the risks to security of supply across Great Britain and have the tools to address any issues, including major plant closures, that emerge both nationally and in Scotland." Scottish Labour's Shadow Energy Minister Tom Greatrex said: "The ongoing threat to Longannet brings sharply into focus the increasingly imbalanced energy supply we have in Scotland, and why we need to ensure we have a balanced energy mix for the future."